My thoughts entirely! Well done! I love this, Lauren! It’s true too. A hand written note does touch the heart far more than an email or text. And yet it made me a little sad, as letter writing has always been a love of mine and now I have to type everything. My handwriting, though I say it myself, was very good and I miss it very much. Having said that I do still type letters rather than email, so the sentiments are still there and devotion to time. 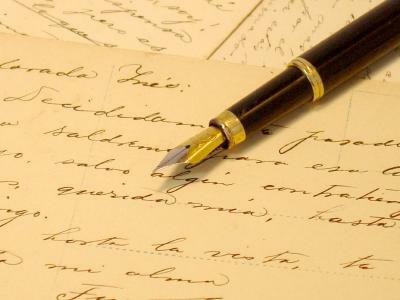 But the age we live in means letter writing has taken a back seat and I find that sad too. The envelope and stamp set – refreshing to see we still exist. I agree totally with your poem, Lauren. A letter in your mailbox is something still very special 🙂 and I do scribble lines still on paper. Penny, I missed another comment from you and I’m so very sorry, as this one is quite emotional and deep. Your parents sound like mine, as mine were almost to 67 years before Mom died over a year ago, although, Dad is still living at 93. I’m glad you found your Mom’s letter; something tangible to keep as a reminder of her wonderful love and the wonderful relationship you both had. Emailing is fun and fast, but there is just no comparison. Thanks so much, my friend, for sharing this part of your life. Many hugs! I too, miss the scented stationery days of old, Lauren. Times have really changed, everything moves fast in a click of a button, or touch of a screen. Kids nowadays wouldn’t know how to use a fountain pen nor write in Palmer’s, and the cursive Peterson style. We are lucky to have had the best of two worlds, one is a treasure, and the new as a survival tool. So, cheers to both! Wonderful reflection, Cynthia, which I completely agree with! My kids are older now, but they both still enjoy reading books, even though they enjoy being plugged in, too. I hope young children are still taught to read real books. Love and hugs!